How do you handle requests for personal days, annual leave, or other vacation needs from your employees? Does it become a trail of email threads, messages, and continual calendar updates? There’s a simpler, more efficient way to handle these requests. You can set up a dedicated Teamup Calendar, or use several sub-calendars in the Teamup Calendar you’re already using. Set up a sub-calendar for Pending requests. Set up another sub-calendar for Approved requests. A team calendar with Pending and Approved sub-calendars. Include both sub-calendars in all employee calendar links, with appropriate permissions. For example, Add-only or Modify-from-same-link permission would be good for the Pending requests sub-calendar. Read-only permission might be the best choice for the Approved requests sub-calendar. Ask employees to input all their requests for scheduling (PTO, personal days, annual leave, extended vacation, specific shift assignments, and so on) into the Pending requests sub-calendar. They can also assign the request to their own sub-calendar. Set up email notifications, either as individual emails or as a daily summary, to stay updated when a pending request has been submitted. Review the pending requests. If approved, move the request from the Pending to the Approved sub-calendar. If not approved, you could use event comments to indicate what needs to change in order for the request to be approved. Let’s use Frank as an example. He wants to schedule some paid time off (PTO) for his annual family trip. Frank has modify from same link permission for his own sub-calendar, and for the Pending Approval sub-calendar. He has read-only permission for the Approved sub-calendar. Frank submits his PTO request and assigns it to both his sub-calendar and the Pending Approval sub-calendar. Frank saves his PTO request to his sub-calendar and the Pending sub-calendar. Now Frank’s supervisor receives an email notification that a new event has been added to the calendar. The supervisor, who has Modify permission for all sub-calendars, reviews the request and approves it by moving it from the Pending Approval calendar to the Approved calendar. The PTO request stays on Frank’s sub-calendar, as well. Now the PTO request is approved and locked (Frank cannot modify it once it is moved to the Approved sub-calendar). An approved request can be seen by everyone on the Approved sub-calendar. Frank can leave information like his emergency contact information on the PTO event. The supervisor and other team members can see all approved vacation requests by viewing the Approved sub-calendar. There are other ways to set up this type of approval system, of course. 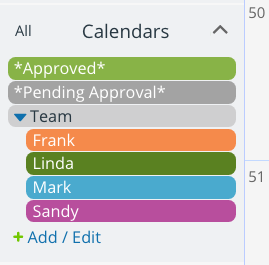 If desired, you could have employees input requests onto their individual sub-calendars, and use custom event fields to mark their status as a pending request. 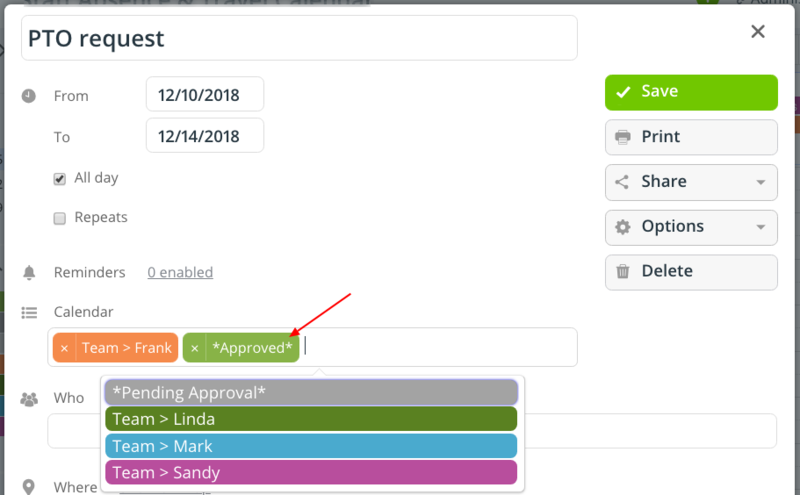 Read this post for more details about how to use Teamup as an approval system.